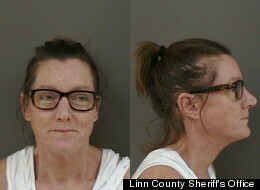 In the Spring of 1997, a 38 year old, drunken Jean Keating, sideswiped a vehicle driven by Jewel Anderson. This move caused Jewel to lose control of her vehicle and ultimately her life. Anderson's vehicle crossed the median of an Interstate and was struck by an oncoming motorist. She died on the scene. Since 1997, Keating, the sole woman responsible for Anderson's death, had been successfully evading the law, until she decided to brag about getting away with the accident which caused the unfortunate death of 65 year old Jewel. Earlier this year, authorities in Manitoba, a province in western Canada, said they received a tip that Jean Terese Keating, 54, was overheard bragging about getting away with suspected a drunken driving crash in the United States several years ago, The Oregonian reported. She was taken into custody in Canada in April and booked into the Linn County Jail in Albany, Ore., Thursday, according to the report. She was originally indicted on charges of manslaughter, DUII (driving under the influence of intoxicants), reckless driving and reckless endangerment stemming from the crash that caused the death of Jewel Anderson 16 years ago. On April 13, 1997, Keating, then 38, was driving on Interstate 5 when she veered right and sideswiped a car driven by Anderson, 65, according to local reports. Anderson lost control of her vehicle, crossed the center median and was hit by an oncoming sedan. She was pronounced dead at the scene. Keating was indicted in June 1997, but failed to make her scheduled court appearance. Her lawyer was worried Keating had "flown the coop," according to local station KVAL. A warrant was issued for her arrest. For years, officials followed dead-end leads to no avail. Then, earlier this year, one tip led to a major breakthrough. After hearing about the bar bragging, a Manitoba officer was able to identify Keating -- who was using a different name at the time -- by comparing fingerprints from a past drunken driving arrest in Canada with prints from the U.S. database, the Register-Guard notes. She was arrested April 8. On June 13, she was taken into custody in North Dakota. This lady is a piece of work... A CRAP piece of work. First: She's a drunk that likes to drive; endangering all others in vehicles around her. Second: Who brags on killing an old lady??! The American and Canadian roads are a tad bit safer with the lock up of this one.